Since I’ve been spending some time in the wayback machine lately, I’ll offer up one last retro post looking back at Fry Fest 2011! Fry Fest was started in 2009. I didn’t attend the inaugural Fry Fest, as I spent the weekend with my new girlfriend (now wife) Ashley watching the Hawks survive against Northern Iowa. My first Fry Fest experience was in 2010 and I had an incredible time…something I’ll need to write about in the future. But this post is about the third annual Fry Fest, held on September 2, 2011. It was Dan Gable day at Fry Fest, honoring the coaching legend with a “This Is Your Life” program littered with Hawkeye stars. Fry Fest 2011 also recognized the 75th anniversary of the now-defunct Scottish Highlanders and the 25th anniversary of the 1986 Hawkeye women’s field hockey team, which won the national championship. I’ll be honest…as an author, I don’t do very many book signings. First of all, as a practical matter, I live in Washington DC, which means I only make it back to Iowa a few times a year. And obviously, if you’re going to hold a book signing for Hawkeye books, it makes the most sense to do it in Iowa. But the bigger issue for me is a philosophical one. Don’t get me wrong…I love, love, love meeting fans and signing books for them. It’s a real treat, and I enjoy doing it. If anyone wants me to sign or personalize one of my books, please don’t hesitate to contact me, because I’m more than happy to do so. But an actual book signing event? I’m not delusional enough to think that I’m John Feinstein or Richard Castle or anything. Maybe it’s just my own insecurity, but when I hear the phrase “book signing”, I think of a sad, small-time author sitting behind a table at a local bookstore. The author is sitting in their chair, waiting for a passerby to acknowledge him or her, while the few customers in the store make a deliberate effort to avoid eye contact so as to not be forced into a conversation. In the end, the local author winds up signing and selling about four books, all to personal friends and family who probably would have bought the book anyway. Maybe my fears of having a book signing where only one or two people outside of my wife and mother showed up are unfounded. Then again, maybe not…and I’ve never really cared to find out. I guess I just assume that many book signings serve as a dose of needed humility for ego-driven authors…an event set up by a writer to be noticed and recognized and patted on the back but which ends up reminding said author that the overwhelming majority of the population doesn’t know (and doesn’t care) who you are. I never wanted to be that guy you feel sorry for behind the table, starved for an acknowledgment of his existence. Long story short…I don’t do many book signings! In fact, having authored three books, I’ve only ever participated in one. And just so you know I haven’t totally wandered off the topic at hand, that book signing took place at Fry Fest 2011. As with my 2011 radio tour, this signing was set up by Triumph Books. Ashley had never been to Iowa City, so I spent the morning showing her around my old college town. We wound up at Old Capitol Mall (yes, my wife managed to locate the nearest mall), so we took a quick stroll through. 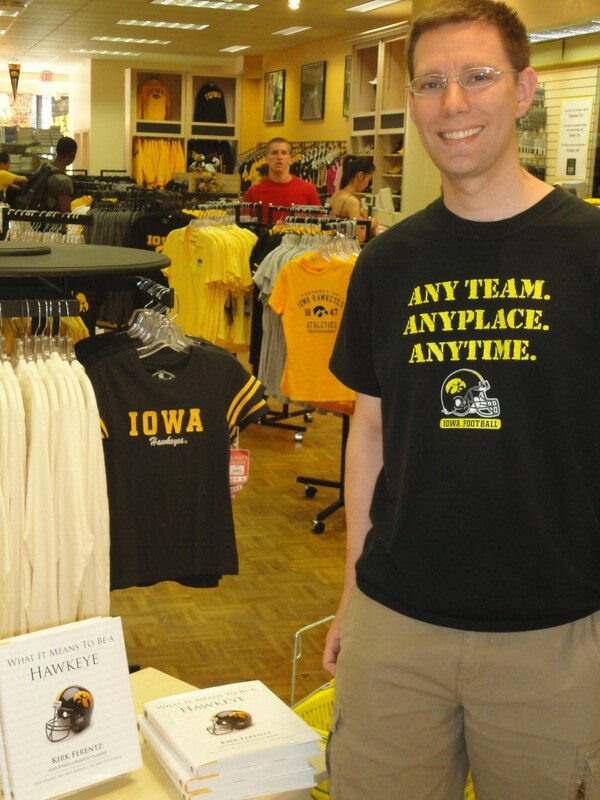 When we came to the Iowa Hawk Shop, my book was on full display in the front of the store! I’ll be honest, that was a pretty cool moment…one that Ashley made sure to capture with a photograph. Then it was off to Coralville for Fry Fest 2011. 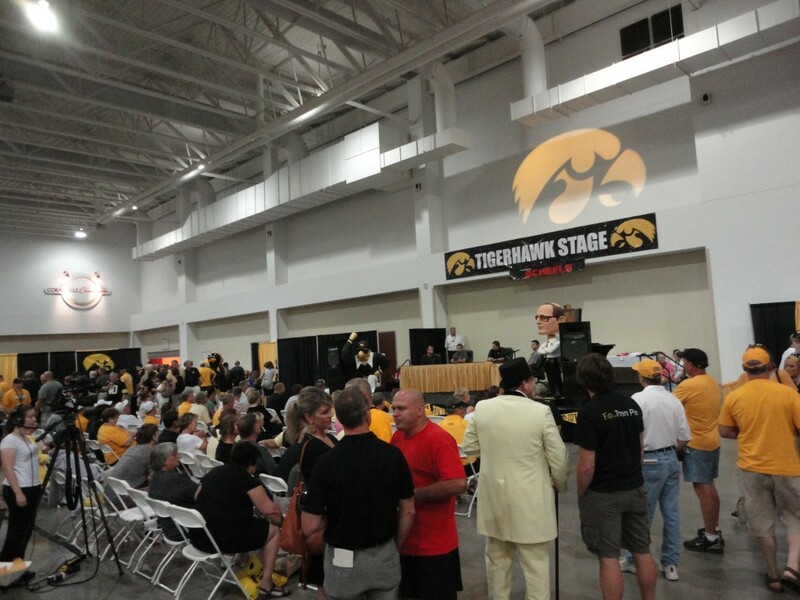 As I mentioned, Dan Gable was the guest of honor, with a giant Gable bobblehead next to the Tigerhawk Stage. Several Q&A sessions were held up on the stage, with outstanding Hawkeye wrestlers of the past reminiscing about Gable the Great. But soon it was time for my first book signing! 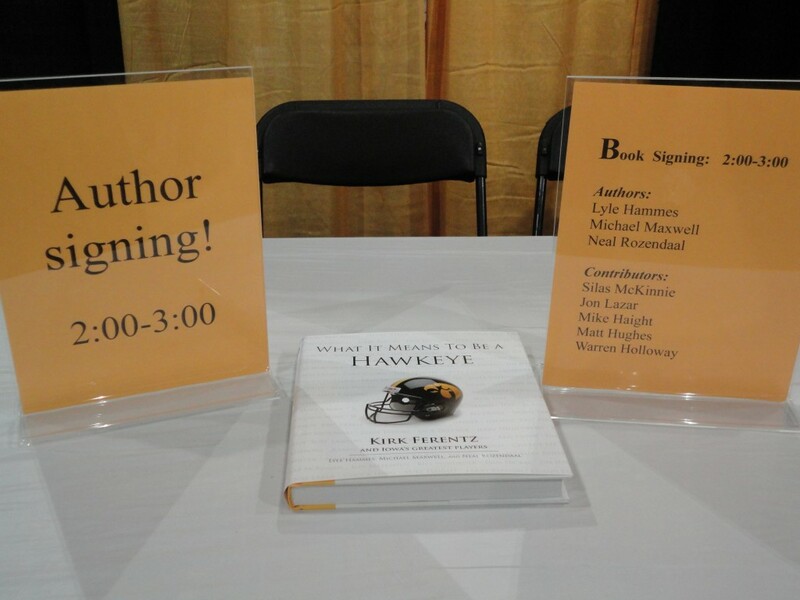 Iowa Book graciously provided a booth for us from 2 PM to 3 PM to hold the signing. Five Hawkeye athletes from What It Means to Be a Hawkeye showed up to sign copies of the book. The publicized list included Mike Haight, Matt Hughes, Warren Holloway, Jon Lazar, and Silas McKinnie. Unfortunately, we found out before the signing that McKinnie wouldn’t be able to make it, but luckily for us, Bill Windauer graciously filled in for him at the last minute. My two co-authors – Lyle Hammes and Mike Maxwell – and I were lucky enough to come along for the ride. It turned into a terrific event. Dozens of Hawkeye fans showed up to get their books signed. 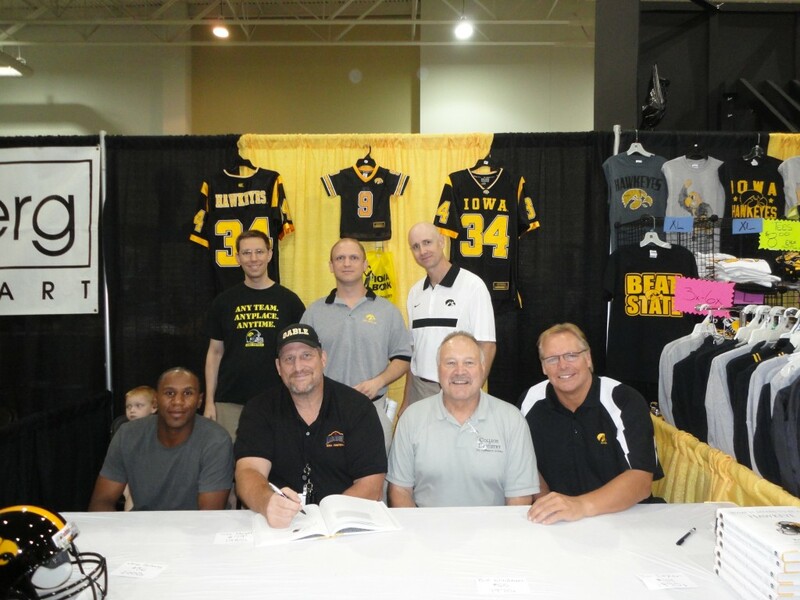 Holloway, being the most recent Hawkeye athlete to play, was the center of attention at the signing, but he was exceedingly gracious and one of the nicest guys you could ever hope to meet. Honestly, all five of these Hawkeyes were fun, funny, and a blast to be around. I have to give Ashley, my then-girlfriend, a shout-out here, too. Fans kind of descended on the table and were milling around it in a pack, hoping to get their autographs. People were coming in from all sides with no real direction, and the signage on the table didn’t really make it obvious that it was a book signing. Ashley organized the proceedings, stringing fans into a waiting line and standing out in front of the table with a “book signing” sign. She also called out to passing Hawkeye fans that there was a book signing taking place with former Hawkeye athletes. I have no doubt that the event went far, far more smoothly thanks to Ashley’s take-charge attitude. As I mentioned, it was a wonderful event. Most of the players even stayed past 3 PM, signing autographs for everyone who wanted one. I was able to listen to all of these guys for over an hour, and it was truly a memorable day for me…one I’ll never forget. Standing left to right are yours truly, Lyle Hammes, and Mike Maxwell. Seated at the table from left to right are Warren Holloway, Mike Haight, Bill Windauer, and Jon Lazar (Mike Hughes not pictured). Peeking over Holloway’s shoulder is Hammes’ son, Ben. Finally, credit to our photographer, Ashley.